You don’t know it yet but, in a few short minutes you’re going to learn how to trade multiple MetaTrader accounts using the Local Trade Copier. You probably already know that MT4 trading platform does not give any option to trade multiple MT4 instances at once automatically, right? Well, let me jump straight to the point and explain to you how you can do this using the Local Trade Copier. You just have several MetaTrader accounts on the same computer and you link those accounts using the LTC trade copier. Now when you initiate or execute trades on one MetaTrader account, the same trades get replicated to many other MetaTrader instances. This is how you can trade on a lot of MetaTrader accounts at the same time. And for those who do not know here’s a quick solution to installing multiple MT4 platforms on the same computer. Do you remember the crazy old days where people did these jobs manually, you know hiring teams of many traders that would sit in front of many computers with the MetaTrader platform open and then once the chief trader said “okay everybody go along when you’re a dollar!”, everyone clicked the BUY button. Lucky enough you don’t need to do that anymore! All you need to do now is set up your trade copier, link your MetaTrader accounts and then you just initiate trade once on one MetaTrader account and it gets copied on all MetaTrader instances that you want. I want you to go deep into your own mind and visualize this. Imagine you have a computer or Virtual Private Server (VPS). Let’s simply call them, computer on the internet so to speak. The VPS is running for you 24 hours a day so it is very convenient to use such software on such servers. I personally have dozens of those VPS servers with lots of MetaTrader accounts running and I can assure you it’s exciting! So let’s say you have a computer, and you get your MetaTrader account. So you install Server EA, which is the first component of the software that needs to be installed on all the MetaTrader accounts you want to act as the master. In our case, we have one MetaTrader account and we want it to act as the master account. It’s just a regular MetaTrader account, nothing more, (you know, the one that everyone get from their Forex brokers). After Server EA is installed you install other MetaTrader accounts with the second component that is called Client EA. Up to this point you already understand that the Local Trade Copier consists of two components. The first component, the Server EA, should be installed on the Master side. This is the account where you basically initiate trades or trade manually, run some Expert Advisor like Hedge EA or some other trading robot, or you could even be receiving trading signals from someone else. Additionally, you could be having your account manager that is managing your trades in your account. As you already know, in such case you don’t get access to that trading strategy he is using, but you just see those trades appear in your account. So you just log into your own account (no one’s gonna know about it) running a separate MT4 instance on your computer to see those trades. Even if someone else is executing trading positions for you somewhere remotely, they still kind of belong to you and can could do whatever you want with them. You just install Server EA in there, and now the Server EA will be sending all the trading actions to clients. The second component, the Client EA, will be running on each MetaTrader account that you have. It will act as the client, receiving the trades and repeating them on MetaTrader accounts. You can have unlimited client accounts depending on your computer power. For example, if you take a VPS server which costs around $20 a month, you will be able to run about 4 to 5 MetaTrader instances or so. 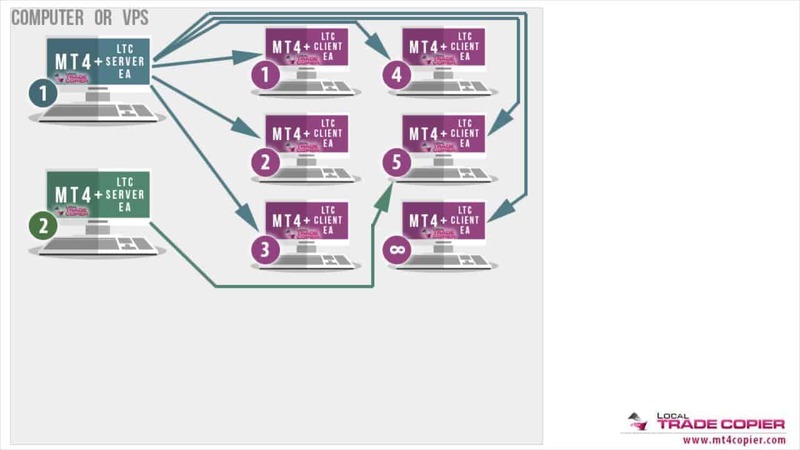 Let’s say if one MetaTrader acts as a master, you can have up to 4x MetaTrader client accounts on that one VPS server and once you need to run some more you just get another VPS server to run another 5x MetaTrader instances. You will agree with me, that it is quite flexible. 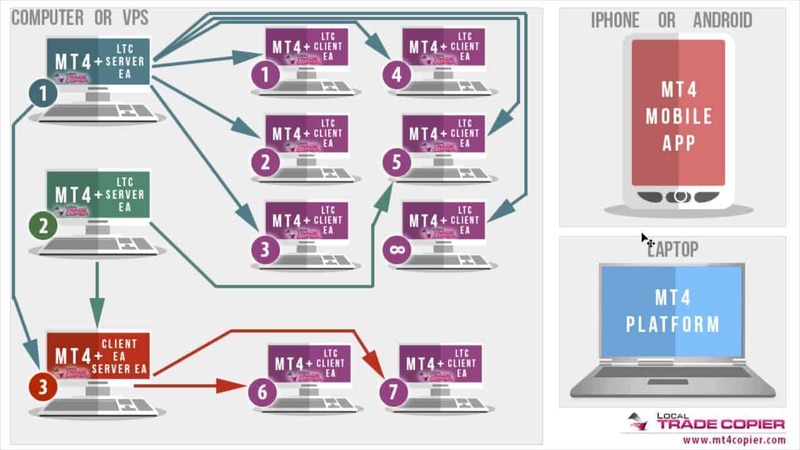 If you will be use your home you might run even more MT4 instances. Personal computers these days are so powerful with all those multi-core CPU processors and huge amounts of RAM memory. You could be running 10, 20 or maybe even 30 MetaTrader platforms on one computer, allowing you to copy trades to dozens of MT4 accounts at once on the same computer. Obviously, you remember the linking I spoke about at the beginning of this article. 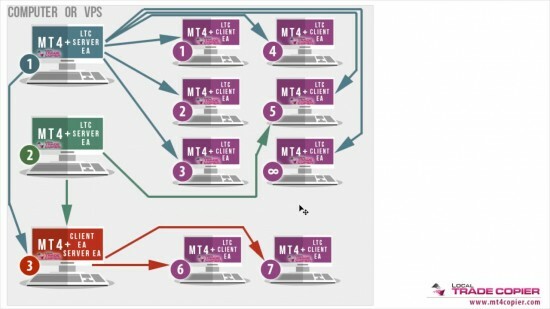 So when you connect MT4 platforms, the setup will look like in the picture below. Illustrating one MT4 master account and several MT4 client accounts ready for copy trading. Each of the client MetaTrader accounts will be receiving trades from the first Master account. Obviously, you can set up this in any way you want. As a fact, not necessarily all MetaTrader accounts running on the same computer must be copying the trades. You could have some spare MetaTrader accounts for other purposes or whatever you want to do, but in this demonstration I just linked all the MetaTrader accounts. So this was a basic setup, just copying one MetaTrader to several client accounts. Now, let’s try to make the set-up even more advanced. Let’s get another MetaTrader account which will act as a master as well. You will need to get another Server EA installed on this account and the only thing you would kind of need to change is the group ID for that Server EA. You kind of create another group of trades or group MetaTrader accounts and then you link this new Master account #2 to copy trades just to selected MetaTrader client account #5 as illustrated in the picture below. Master account #2 copy trades to client account #5, while Master #1 copy trades to rest of the accounts. So now you have Master account #1 copying trades to all the MetaTrader client accounts you have, except client account #5. Master account #2 copying trades to client account #5. Obviously you can set this in any way you want but just for this demonstration, I’m copying trades to only client account #5. I wonder if you’ve already noticed that you are half way into the article! So, let’s go to the next level, which could get you even to a more advanced stage. Let’s say I get the third MetaTrader account which will first act as the client account receiving trades from masters 1 & 2, and also act as a server account copying the trades to other two MetaTrader client accounts numbered as 6 & 7 in this demonstration. So the third MetaTrader account basically has the Client EA and the Server EA running at the same time. Visualize this in the figure below. Red MT4 account on the left-bottom acts as a client and server at the same time re-copying trades from masters 1 & 2 to client accounts 6 & 7. So we have a computer or a VPS with a lot of MetaTrader accounts copying trades to other client MetaTrader accounts. It is obviously quite a complicated set up but I hope you guys will not get confused by that as I have just tried to draw this quite as simple as possible. It doesn’t end there though, and rare thinking people like you may already be wondering if it could work on a smartphone huh! Just suppose you have this setup at home. Let’s say you have a VPS running with trading robots in there and trades are copied. Now at some point you want to change something, close some trades or you are additionally trading manually on one of those masters and need to place a new order. Whatever reason you have, it’s your business. The point is, if you must do this while you’re going about your daily business as usual, like standing in line at your grocery store or whatever activity it maybe, it is very easy! 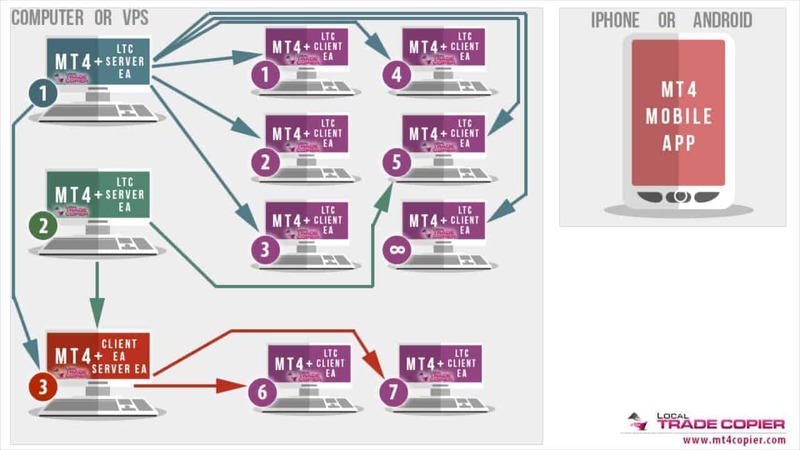 Just pull out your iPhone or Android Smartphone, open your MT4 Mobile app (MetaTrader has a mobile version of the app) and do any trading actions you need. From your MT4 Mobile app you can log into any of those master or client accounts and do whatever you want. You can close some trades, check how the things are going or even additionally execute some trades in one of those master accounts and so on. Let’s say you execute the trade on the first master from your smartphone. Even if you’re in another country, the MT4 running on your computer will pick up the trade immediately, and Server EA will see that, meaning it will detect the new trade even if opened from the mobile app. Then Server EA will copy the trade to all of those client accounts that it is linked to. Copying trades from MT4 Mobile app to client accounts. It is just as simple as that. What if you must travel and are on the road? You can pull out your laptop, open your MT4 platform anytime, log into one of those MT4 accounts and do whatever you may want to do on them. Same thing applies even if you maybe in your home office or at work and working on your laptop. So basically, there are so many ways to log in and see, observe, make some changes and execute trades and so on. Once Copy Trading setup on VPS server you can control the trades and add new ones from MT4 Mobile app or laptop while traveling, or simply from your home or office computer. As you can see, Local Trade Copier quite powerful! The problem is that a lot of people do not understand this simple concept that you can execute trades remotely from any other device on the same master account that you are running on another computer with the Local Trade Copier setup and all these will be copied to your client’s account. What is important is that you have MetaTraders running all the time and that’s why I recommend you to get a VPS Server. Once you get that, you will see that basically there are no limits how you can set this up. So hope you guys enjoyed Local Trade Copier explanation of how it works. Please share this article with your friends and those you think it might help. Post your comments below. I always answer questions you have. at the moment I do not offer signals, but I plan to do so in the future. When I copy trade does it automatically adjust lot size ? Greetings, i will still need the clients login information for me to set up the trade copier up right or else how am i suppose to trade the clients account? Hi, yes. Of course you need login information of your clients account. If client allows you to trade his account he will give you permission/login information. Hi, do you know where I can find a good VPS provider? yes, you can use read-only MT4 investor password to copy the trades from your account to other accounts using my MT4 Trade Copier. those this mean,i can copy without my fund managers knownledge into another mt4? Yes, it means you can copy without your fund manager’s knowledge into another MT4 using Local Trade Copier. You just need to have password to the MT4 you want to copy from. Can it copy trade from investor account to my master account? Good day sir, I watched clip on server EA and it is fascinating. Now if I open the mt4 with different brokers to use the server EA, do I have to fund all my account with the various brokers before they could copy the trades executed by the master mt4? You can use the same broker or you can use different brokers. It is up to you how you want to do it. Does your copier effective for both internet and intranet.? I am very interested about it. I would like to know about its execution speed. The Local Trade Copier copy trades between MT4 accounts when installed on the same computer. If you want a remote trade copier to copy trades between MT4 accounts located on different computers then you need Signal Magician. Forex trade copier is a blessing for those who do not have time in trading. Most often because of vps or connective trades are not propagated. Would you please make sure your trade copier works well both in forex and binary? Hi, thanks for the feedback. My copier already works for binary options if it’s on MT4. But you need VIP license for that. Yes, you can set different lot sizes on different accounts. You can contact Rimantas here. Here is a video where all risk parameters are explained. No, the password does not give access to withdraw the funds. I bought an annual subscription for VPS and want to trade on behalf of my clients. I have installed the MT4 Master account as well as the MT4 Slave accounts on my PC. However, I do not possess the login credentials of my clients. Can I trade on the Master account and copy the trades on the Slave accounts automatically using your forex copier software without having to login or run the Slave accounts on my PC? Ideally, I would like to trade on behalf of my clients without having to login to their accounts. Can they run their MT4 accounts 24/5 and copy my trades without providing me with their login credentials. With all the respect, Petros, but it does not make sense. If you wouldn’t need a password to trade someone else account then it means anyone can trade your account or any other account without the password or permission. It wouldn’t make sense. The password protects other people from trading your account so you wouldn’t normally give your password to anyone. 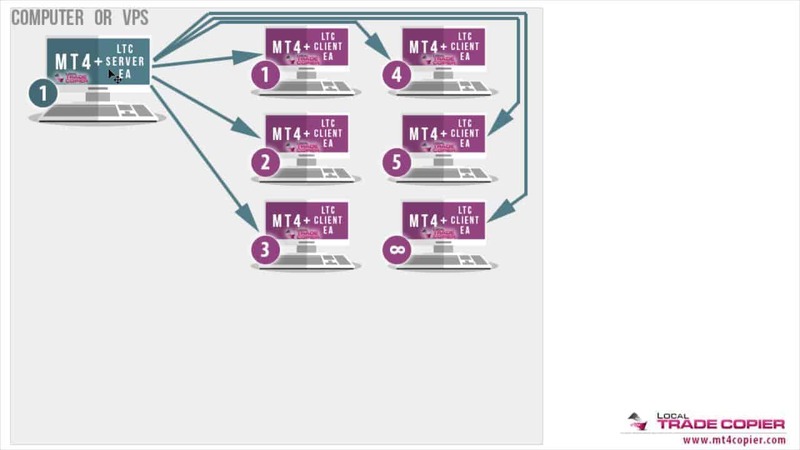 MT4 needs to be running all the time to copy the trades and yes, you will need a main password of each of your client’s MT4 account if you want to trade for them. Can the copier copy from DEMO account as master and LIVE account as Slave and vis versa whether from the same broker or different brokers? Further more, how many pairs can the EA handle at once? Yes, Local Trade Copier can copy from demo or real account to the demo or real account. Please submit your questions in English to our support team here. i want to know,, if i do master layers of multiple account, can the first master account be able to see sub master account? secondly can i remove any client account by myself? Master accounts do not see other accounts because they do not look at them. Master accounts just share their trades with other accounts. It is the client accounts that read the trades from Master accounts. But yes, sub-master account can copy trades from Master account and then client accounts can copy from sub-masters. Multiple layers are possible. You can remove any client yourself because you will be running all MT4 platforms on your computer or VPS server. Thank you for your comment. Local Trade Copier has a partial close capability. Simple example: If you have a trade copied from your master account to your client account and you close some percentage of that trade on master (for example 50%) the same percentage will be closed on your client account too. However, keep in mind that partial close feature only works when magic number in copier settings is 0. Here is a video about trade copier partial close. Hi, may I know if your copier can copy MAM/PAMM accounts? My MAM account currency pairs are labelled with a .pro, example USDJPY.pro, GBPAUD.pro and etc. Local Trade Copier can be used to copy trades from PAMM/MAm accounts.